WASHINGTON — The Trump administration on Tuesday sued to block California laws that extend protections to people living in the U.S. illegally, the most aggressive move yet in its push to force so-called sanctuary cities and states to cooperate with immigration authorities. California officials remained characteristically defiant, vowing to defend their landmark legislation. “I say, bring it on,” said California Senate President Pro Tem Kevin de Leon, a Los Angeles Democrat who wrote the sanctuary state bill. It is the latest salvo in an escalating feud between the Trump administration and California, which has resisted the president on issues like taxes and marijuana policy and defiantly refuses to help federal agents detain and deport undocumented immigrants. U.S. Immigration and Customs Enforcement has said it will increase its presence in California, and Attorney General Jeff Sessions wants to cut off funding to jurisdictions that won’t cooperate. The state laws being challenged were a response to President Donald Trump’s hawkish immigration policies and widespread fear in immigrant communities following a campaign in which he promised to sharply ramp up the deportation of people living in the U.S. illegally. The decision to sue California shows Sessions and Trump remain aligned on this priority, even as their relationship has recently deteriorated, with Trump attacking his attorney general and Sessions pushing back. One of California’s laws prohibits employers from letting immigration agents enter worksites or view employee files without a subpoena or warrant, an effort to prevent workplace raids. Another stops local governments from contracting with for-profit companies and ICE to hold immigrants. Justice Department officials, speaking to reporters Tuesday, said that violates the Constitution’s supremacy clause, which renders invalid state laws that conflict with federal ones. Sessions planned to discuss the lawsuit Wednesday at an annual gathering of law enforcement officers in Sacramento. 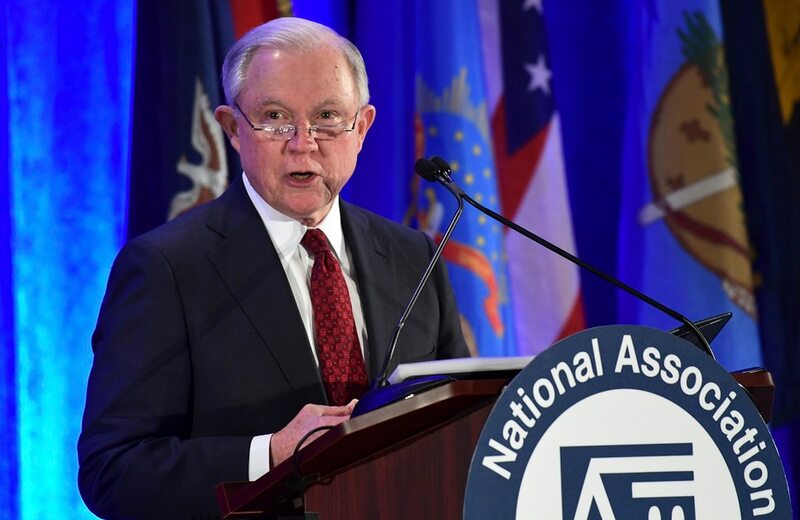 Sessions’ audience Wednesday includes members of the California Peace Officers’ Association and groups representing police chiefs, sheriffs, district attorneys, narcotics investigators and the California Highway Patrol. The groups’ members have often been split on sanctuary policies. None of the groups favored the state law restricting cooperation with immigration officials, but only the California State Sheriffs’ Association was actively opposed and some individual officials voiced support. Becerra, a Democrat who is up for election in November, has been sharply critical of Republicans Trump and Sessions, particularly on immigration policies. He will speak to the same conference later Wednesday.